Glorious Leader Conveniently Forgets About Roy Moore - Joe.My.God. 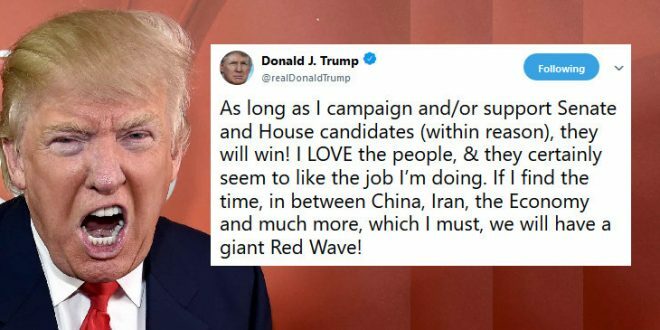 President Trump predicted Wednesday that the congressional candidates he campaigns for and endorses will keeping winning, most of the time. Trump campaigned for Republican House candidate Troy Balderson in Ohio ahead of Tuesday’s special election, and credited his turnaround to the rally he held for the newcomer. He also took another jab at the “fake news” that he said falsely claims that Democrats are the clear favorites to win. “As long as I campaign and/or support Senate and House candidates…they will win!” @realDonaldTrump says.